My first year of teaching, I was the queen of teaching problem solving. 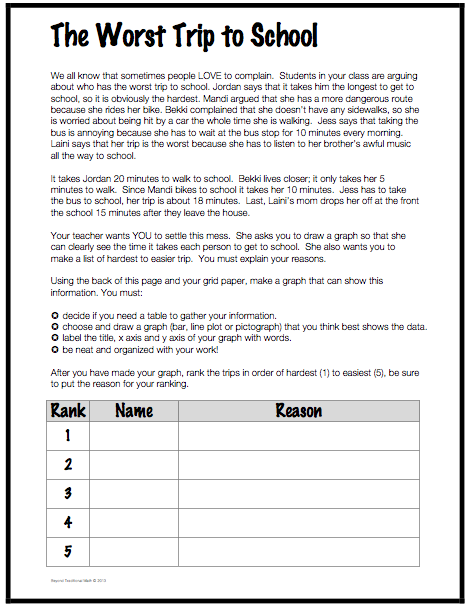 I would stand up in front of my students each day, and show them my beautiful strategies for solving the problems. Over and over, they would see my drawings, my number sentences and my solutions. I would ask them to copy them down if they couldn’t figure it out, so that they would have an idea for the next time. As I’d look at my data, I would notice that I had a top group of problem solvers who could always solve it, a big group of solvers that would typically get the problem correct, and a group at the bottom that would NEVER get the problem right. I was foolish enough to believe that this was okay. I thought that some kids just weren’t very good at problem solving. I was SO wrong, and I am SO embarrassed to admit this now. My second year of teaching, I heard this quote: “The person doing the talking is the person doing the learning.” I honestly felt sick to my stomach, because I realized that I was doing WAY too much of the solving, working and showing. I needed my students to take ownership, stand up, share their thinking in kid speak and start to GROW. I learned a lot that year, that students aren’t born to problem solve. It is something that requires an immense amount of practice. 1. I assess what problem types the students can solve. Did you know that there are 9 problem types for multiplication and division in the common core? I use a series of multiplication and division problems, administering the first in the set to see how they do on each of the 9 problem types. I compile the results in a data table to see which ones the class struggles with as a whole. Then, we attack those problems one by one throughout the school year. I assess them again at the end with the last problem in the set to measure growth. 2. I introduce the Standards for Mathematical Practice. 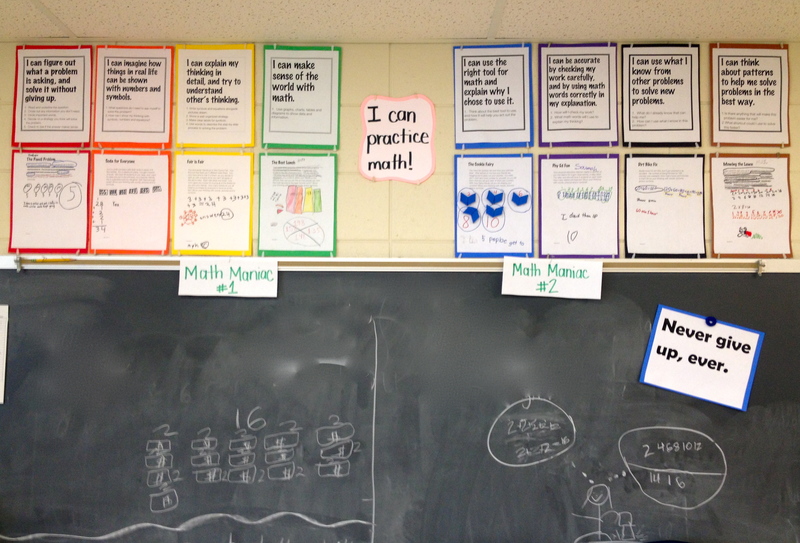 These standards are SO important for students to develop as math habits. They cannot be stressed enough. It takes us about a week and a half to get through them all, but it is worth the time. I post our work daily on the wall. The vocabulary from these standards becomes a part of our every day language. 3. I start small, with practice problems that are simple that they can relate to. Then, we go BIG. I have three types of problems that I use juggle through and use. Simple Problems: There are so many problems out there about trains arriving and leaving on time, or other topics that students cannot connect to. I finally broke down and created problems over the years that would allow for practice of multiplication and division concepts. The problems are about things that students can understand. These are done on most days, with other problem types sprinkled in from my current math series. These simple problems are NOT done every day. That is not enough for students to become strong problem solvers. 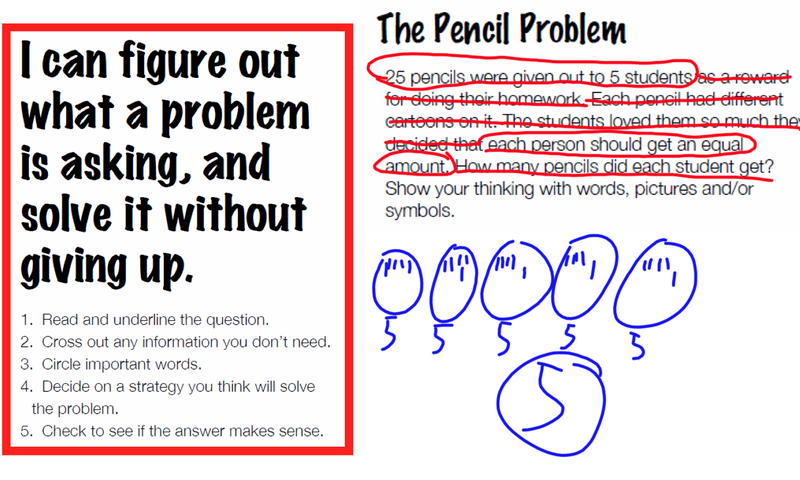 Open Ended Problems: These problems require more reading, more steps and are much more complex. There are times that these problems require two 20 minute class periods to complete. These are the types of problems we will find on the Smarter Balanced Assessment next year. Project Problems: These are always my student’s favorite type of problem. They spend several days on these problems and are a bit more out of the box. I always begin with the Book Order Proposal and go from there. 4. I make manipulatives available to them from the start, and I encourage their use. The idea that hands on problem solving is for young students only, or for struggling problem solvers is incorrect. Manipulatives are wonderful for any level of problem solver, it promotes deep thinking of the math concept you are working on. 5. 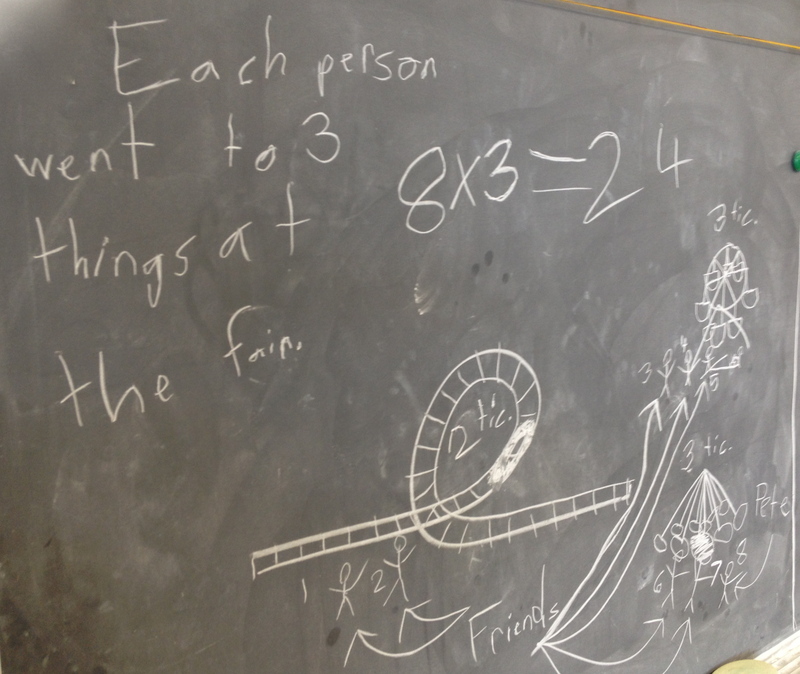 I allow students to model their thinking in front of the class. More about how I do this you can find in this post. They solve it, explain it to the class and accept questions and compliments from the rest of the students. This is where the students do the talking, the questioning, the complimenting. They are seeing multiple strategies each day, they can “steal” ideas from each other and are held accountable for their work. I keep a tally chart right on the chalkboard so that students can see how many times everyone has been up. We try to make it equal, even though problem solving comes more naturally to some than others. This helps everyone know that they are ALL welcome up to the board, even if their solution is wrong. Day 2: Problem from math series covering current concept. Day 5: Problem from math series covering current concept. 7. I keep accurate records for myself. I have a class list so that I can see when students are getting the problem correct. I keep the problem as our daily focus until 90-95% of the class has mastered it. I have an answer key that allows me to check off when we’ve done the practice problems so that I don’t accidentally repeat the same problem. 8. I intervene with students when the problem type is a struggle. I pull small groups during our math work time, in the morning when students come in, during recess, during our intervention block time, whenever I can to get those students up to speed. Many times they just need more one on one support to be successful. I don’t wait any more for them to figure it out on their own. I intervene as soon as I notice the struggles. It sounds like a lot, but once we get in the groove, and routines are in place things get ROCKING! I didn’t realize how much students love this process until we had a substitute teacher in for a day. The teacher worked the problem out on the board much to the anger of my students! The next day, they were SO fired up and upset that she didn’t give them time to work it out on their own. That is when I knew that the students in my classroom were finally owning their own learning. I am not sure if you’ve ever had that “moment”. The moment where you are at a frustration level with why things aren’t working. I used to look for extra worksheets to give more time for tricky math concepts to “stick” with students. I looked online for further practice activities, I asked colleagues for their extra resources for more practice, I looked for games. I felt like I’d tried everything. That’s when I read some research that making math real world, connecting it to student’s lives was REALLY good practice. So a few years ago I started to create real world problem solving projects to help this problem. I made it my problem of the day for 4 consecutive days, giving 20 minutes each day for the project. The first three were days for them to work (with a mini lesson or two if needed), and the fourth day was the peer review day. 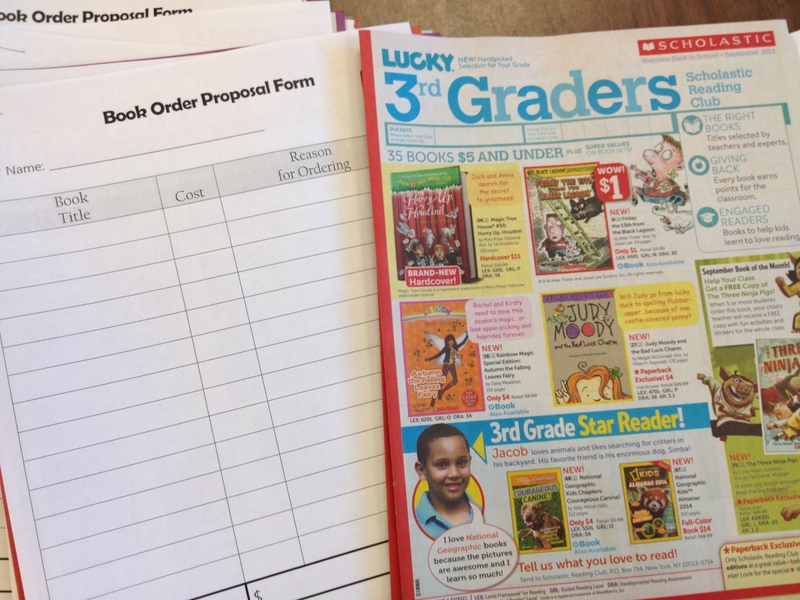 All students were given a budget of $50 (bonus points offset this cost-I was able to get all of our books free this last round) to look through three Scholastic flyers. 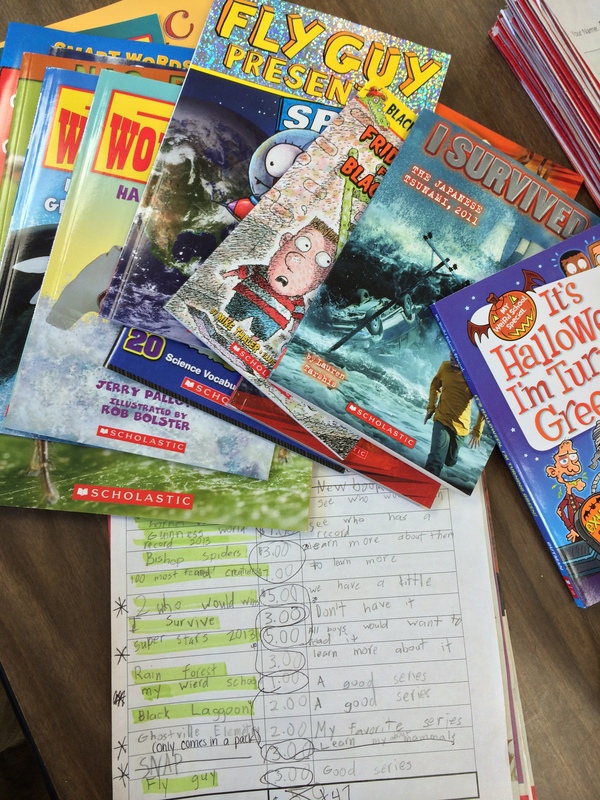 The students had to put together a proposal, thinking about their classmate’s reading interests, as well as thinking of what we currently have in our classroom library. At the end of the project we laid the papers out and did a gallery walk. Students voted on their top 3 favorite proposals. The proposal with the most votes actually got ordered! It was such a fantastic way to end the project. My favorite part though, the very best part of the entire project, was the gallery walk and natural reflection. Students could see how others choose to put the proposals together. Some were neat and organized, others were missing information, some of them had a hard time with their handwriting, and other student’s numbers didn’t quite add up. It led to great discussion, and the students wrote goals on their proposals for the next time we have to present information to our peers. It has been clear to me that making math real world, and connecting it to their own lives is a powerful thing! In the beginning of my teaching days, I was terrified of manipulatives. I thought that students would mess around with them, blocks and chips would be flying through the air and no one would be learning. I’ve learned the last few years that the opposite is true. 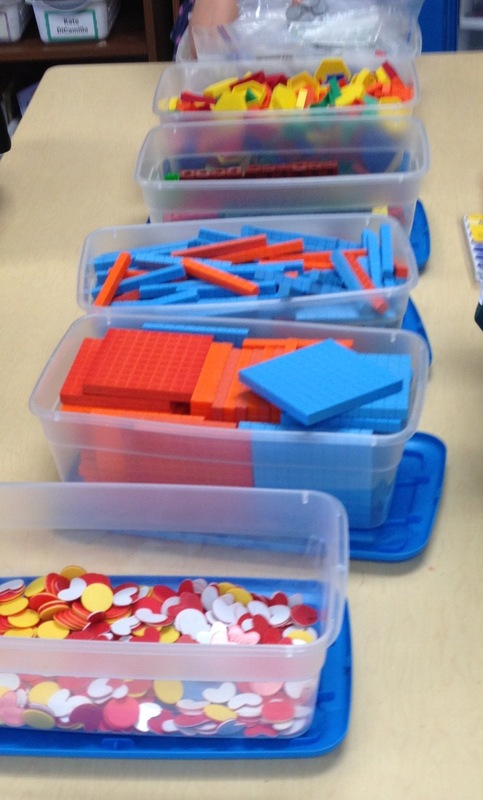 Manipulatives have become a way for students to both play and discover math concepts in my classroom. Today the learning target was: I can discover addition rules. It was awesome to see how they were thinking. In just a minute or two, they figured out the commutative, associative and identity properties of addition. I walked around to each student, dropped counters into their cups, and asked them to record as many number sentences as they could with their chips. 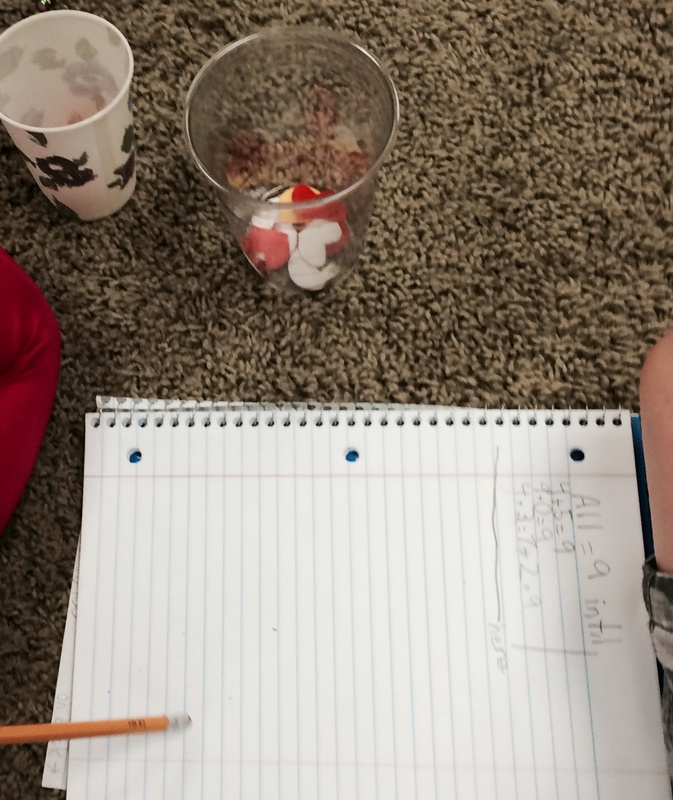 I was able to differentiate easily by dropping a small number in the student’s cups who were struggling, and larger numbers in those gifted student’s cups. Some of them asked for 3 cups, others stuck with two. They were sorting and dumping the chips, writing number sentences as they went along. In every number sentence I always had the same sum. Tomorrow I will name these things for them. We will learn that those exact “rules” they came up with are actually properties of addition, which can then translate to multiplication later in the year. I now know that purposeful play is an important part of the learning process. My goal is to integrate this more and more each day!